From the Batman collection by Mezco Toyz. Batman Returns Mini Mez-Itz 2 Inch Mini-Figure 3 Pack. From the Batman collection by Mezco Toyz. 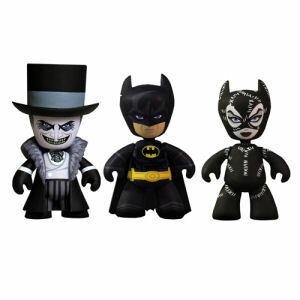 Batman Returns Mini Mez-Itz 2 Inch Mini-Figure 3 Pack. Batman - Penguin - Catwoman Figures measure 2 inches tall. Mezco Toyz Batman Figurines shipping from Canada. No Surprise Border fees or Customs!